Nope, you don't have to feel sorry about the super zoom lens that you bought for your DSLR just last week. 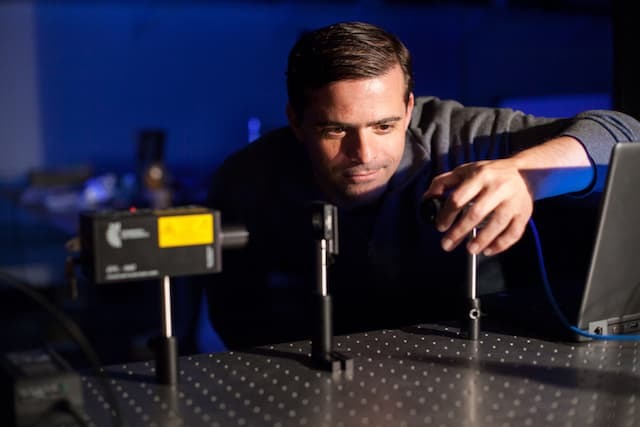 The latest innovation from the engineers at Rice and Northwestern Universities currently works in the labs only but it could be the right step in the direction of using smaller lenses to capture distant images. Researchers working on the project believe that maybe in a decade, we'll be able to use the technology outdoors. The new system called SAVI aka 'Synthetic Apertures for long-range, subdiffraction-limited Visible Imaging' uses coherent light to illuminate a distant spot and then uses complex algorithms to create high resolution image, all without needing long lens. The SAVI camera takes multiple images of the spot from different locations and then compares the interference pattern between the captured images. Prof. Veeraraghavan, the lead researchers of the project says that a fingerprint or even the texture of paper can cause the same effect of interference. The power of the laser used decides how far the object to be illuminated can be. Computer algorithms allow for eliminating the dependance on the size, volume, weight and overall cost of the equipment. Jason Holloway, the lead author of the paper says that in near future, an array of budget friendly sensors and plastic lenses will be able to produce images of the same quality that today's $100,000 telephoto lenses do. Such a setup, comprising of array of sensors and lenses would eliminate the need of moving the camera to illuminate the spot from different angles. The breakthrough for the researchers was the discovery that they could put the light source to illuminate the object on the same side of the camera, and not behind the object. Get more information about the research project on the source link below.